A video from 2001 is making the internet rounds these days, one that shows current Israeli Prime Minister Benjamin Netanyahu talking to a settler widow who had just lost her husband to a Palestinian attack at the beginning of the second intifada. Well, the wifi and fiber optic networks were abuzz. Here is Bibi with his guard supposedly down. The video is said to have been taken without his knowledge, so we’re supposedly getting the unvarnished Bibi. I’m not so sure. The takeaway seems to have been “Here is the real Bibi, don’t you see he never wants to make peace?” I think the video shows something else, that Bibi is just a huckster, a politician who is always playing to the crowd. And that he is afraid of a negotiated peace—just like his fellows. Just because he didn’t know there was a camera running doesn’t mean Bibi wasn’t still performing. He knows well that the settlement communities are very tight-knit, and what he says in the home of a settler who just lost her husband almost certainly would be repeated, making its way quickly throughout the West Bank. At the time of that meeting, Bibi was trying to consolidate a hard right opposition to then-Likud leader and Prime Minister, Ariel Sharon. I’m not at all convinced he was being any more sincere with this woman than he was with the Israeli and global public when he accepted a “two-state solution” last year. Gideon Levy of Ha’aretz, reacting to this video, was certainly right in saying it shows Netanyahu to be deceitful. But I still think even that correct reaction is misleading. Is there something so profoundly different about Netanyahu from other top Israeli leaders? I don’t think so. Progressive tweeters imply that Bibi is a settler’s Prime Minister pretending to be a diplomat. I don’t think anyone is confused about Bibi’s base of support, both in Israel and in the Diaspora, being on the right. And that base is certainly the farthest right of any Prime Minister’s since Yitzhak Shamir. But what is the result in reality? That Bibi is fighting for the continuation of the settlement project while professing to be eager for peace? Well, yes, but how is that different from most, and perhaps all, previous Prime Ministers? No one can say what would have happened had Rabin lived, but in the event, the Oslo agreement which was his crowning achievement, ended up creating a process to stall peace, a mechanism which was used by both sides. 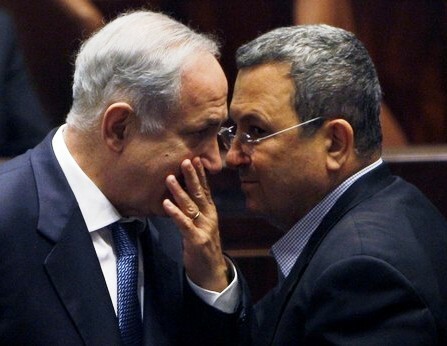 Barak’s failure at Camp David is well-documented, a failure he certainly shared with Bill Clinton and Yasir Arafat. But his campaign to blame Arafat alone for the failure (and Arafat certainly deserves a good deal of blame) coupled with the disastrous second intifada to destroy what hope for peace existed a decade ago. One can argue about the real intentions behind Oslo and Camp David II, or on the Likud side about the Gaza withdrawal and the Hebron redeployment of 1997 (which was enacted by Netanyahu in his first term). There is no shortage of interpretations of these events, from all sides, and I have my own as well. But those questions are not the point here. No, the real issue with Bibi is that, at his core, he’s not really different from his predecessors with regard to ending the occupation. Some may hold to the dream of Greater Israel, some may even truly wish to resolve the conflict with the Palestinians. But all of them are trapped by the fear of peace. Israel has lived its entire existence in conflict. That conflict began long before there was even a state called Israel. It’s the way Israel has always lived, and it’s no small part of the very essence of Israel, both in the country and for the Diaspora. Israel as the antidote for the perceived weakness of the Jewish people for centuries is a major Zionist motif, one that runs through many strains of Zionism. And Israel has shown its strength, by winning its war of independence, surviving and thriving while every country around it was in a technical or actual state of war with it. That should have allowed Israel to negotiate a peace from a position of strength and security. Instead, conflict became comfortable for many Israelis, preferable to an unknown future with possibly difficult compromises and, perhaps, intensified internal strife. That’s why, among other reasons, Ehud Barak is perfectly comfortable in the current government, the most right-wing in Israel’s history. That’s why it’s politics, not ideology, which has prevented Kadima from joining the government. And that’s why an ever-increasing majority in Israel sees little urgency in resolving the Palestinian issue and more and more despair. That’s why Ehud Olmert introduced the idea of Palestinians accepting not just Israel’s existence, but its “Jewish character,” why Ariel Sharon’s right-hand man, Dov Weisglass told us that the Gaza withdrawal was meant to pour “formaldehyde” into the peace process. That’s why settlement construction and population did not merely continue but exploded in the Oslo years. And that’s why there will be no peace without outside pressure. Because the living conditions for Palestinians have steadily and dramatically declined since 1993, when the Oslo Accords were initiated, they have not grown similarly comfortable in the conflict. But they, too, will need pressure to make political compromises that will be difficult, particularly on the matter of the return of refugees to Israel. But the simple fact is that more pressure is required on Israel. That country believes it can do what it has done for more than six decades—live and thrive despite the conflict. Palestinians may survive, but they are obviously not thriving, so there is greater incentive on that side already. The internal stimulus toward an agreement and end to the occupation is there among Palestinians, but is much weaker in Israel. That is why, as J Street and other groups often say, American leadership is required to reach an end to the occupation. The trouble is that same fear of peace is present in the US as well. Not among most Americans, nor among the vast majority of American Jews, including the majority of those who support Israel. But it is epidemic among those who have amassed the political tools to seriously impact American politics and policy. The most visible symptom of this condition is the reflex to defend any and all Israeli actions as long as Israel continues its policies. For example, these groups defended the Gaza siege, until Israel, without ever explaining why an alleged security concern no longer existed, changed its policy in the wake of international outrage over the flotilla incident. It cannot be ignored that, between Israel and the Palestinians, the disproportion of power is enormous. As long as the powerful side continues to insist that its draconian policies of occupation are necessary security measures, and as long as that often bogus argument (there are, of course, real security measures, but the security excuse has long since come to blanket far more than necessary) is accepted in Washington without scrutiny, there is no hope for peace. Bibi is no different, in this regard, than the rest of the key Israeli leadership. The solution lies in a new generation of leaders; an Israeli polity that is not afraid of an unknown future, characterized both by peace agreements and uncertainty. It requires leaders who welcome the challenge of playing the very tough game of Israeli politics on a new playing field. And that change needs to happen in the USA as well. J Street, as well as groups like Americans for Peace Now, Jewish Voice for Peace, the American Task Force on Palestine, Churches for Middle East Peace and others are starting to build that new stadium. The Israeli builders have yet to come to the fore. Perhaps the left there has been reborn in the weekly Sheikh Jarrah protests, but that has yet to manifest in any influence in the Knesset. The Palestinians have often been told they need their own Nelson Mandela. They certainly can use one (and the reasons they don’t have one yet are more complicated than you might think), but so can the Israelis. Without a more courageous leadership, there is little hope for resolving this conflict. Because I don’t think the Bibis are right: I doubt Israel will continue to survive and thrive if this conflict doesn’t end. Without an end to occupation and a viable Palestinian state, neither side has much of a future to look forward to. This entry was posted on July 20, 2010 at 11:00 am and is filed under Uncategorized. You can follow any responses to this entry through the RSS 2.0 feed. You can leave a response, or trackback from your own site.